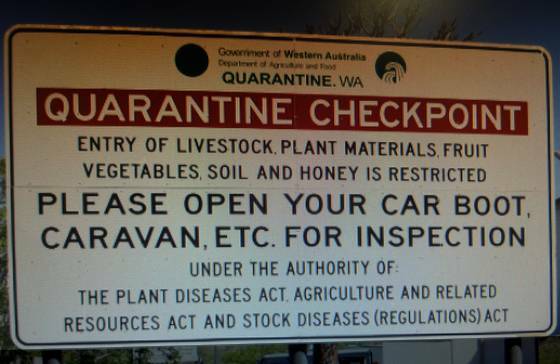 Many Kimberley travellers don't know about our agricultural quarantine until they reach the border checkpoint at the Western Australia - Northern Territory border. The sign greeting you at the NT - Kimberley, WA border quarantine checkpoint. You can not bring fresh fruit, vegetables and some other things into the Kimberley or Western Australia! This page tells you more about the quarantine. What exactly is it? Why is it in place? What can and can't you bring with you when you visit us? It's a different story when people travel around Australia. Backpackers but also campers and caravanners are often self sufficient rather than relying on restaurants, and often they carry fresh food stuffs in their vehicles. One is in the south of Australia (the SA-WA border near Eucla). The other checkpoint is on the Victoria Highway between Katherine and Kununurra, about 40 km east of Kununurra. Now, that border checkpoint is particularly strict, because not only are you entering Western Australia, you are also entering the Ord River Irrigation Area. The Ord River Irrigation Area is a major tropical fruit growing area, and it is the only area within Western Australia that is free of damaging fruit flies. Fruit flies are not just an inconvenience. Due to our isolation, the long distances to markets and the associated costs, the growers here really rely on that fruit fly free status. To lose it would place a huge financial burden on agricultural businesses in the area and would make some of them not viable. Even if your fruit didn't carry any disease, the fines are steep, and your car could be searched by sniffer dogs. So could your bag at the Kununurra airport, and mobile checkpoints may operate in other areas and on lesser roads. To top it all off, we now also have the cane toads on our door step (though that's a different story for a different page on this site). For now just let me assure you that your vehicle will be thoroughly searched. So when you leave Katherine, only take as much fresh food as you will eat before you reach Western Australia and Kununurra. Easy. By the way, there are no such strict quarantine restrictions when you travel in the other direction, from WA into the NT. The quarantine is in place to protect WA and the ORIA region. You do not endanger our growers by exporting fruit fly free stuff from WA. any used agricultural bags and containers (like potato sacks, wheat bags, chaff bags, fruit and vegetable cartons and styro boxes). and you can bring your cat or dog without problems. You can find out more at the website of the Department of Agriculture. Here is their page with Frequently Asked Questions.